Lucidity Festival, a mainstay in the Santa Barbara region and a trendsetter in the blossoming Southern California music and arts festival community, is entering its fifth year at the Live Oak Campground from April 8-10, 2016. 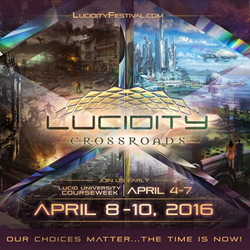 Prior to the event opening to the public, a select group of participants can enroll in the Lucidity University Courseweek, a series of master classes taught by leading instructors from April 4-7th. The University program is an expansion of an incredibly successful Permaculture Design Certification offered in 2015, where more than 35 students spent the week learning techniques and best practices around designing in harmony with natural ecosystems. That pilot program culminated in a Permaculture Action Day in Santa Barbara, where more than 150 volunteers worked on community improvement projects while dancing to the music of The Polish Ambassador and Ayla Nereo. Lucidity Festival is offering five different realms of study, each designed to appeal to those seeking opportunities outside of the traditional education system, to jumpstart their outlook and creative thinking, and to train students to apply valuable techniques to their career paths. “We’ve noticed that traditional education is not for everyone,” said Jonah Haas, Marketing Director for Lucidity Festival LLC. “Many fall through the cracks or don’t see a place for themselves in the system. Lucidity, as a “transformational” festival has sought to be a place for people to experiment with new ways of being, to learn new skills, and to experience a set of possibilities that are not typically offered in today’s degree-focused paradigm.” Executive Produced by Keyframe-Entertainment, Lucidity is also Associate Producer of Jamaica Stevens’s “ReInhabiting the Village,” a book and multimedia community resource project co-created by an alliance of visionary partners sharing their knowledge and experience. Jamaica Stevens will also be at Lucidity Festival leading workshops. Led by Loren Luyendyk of Santa Barbara Organics and other inspiring guest teachers, Intro to Permaculture Design will teach the art and science of creating and maintaining abundant human managed systems. Thomas Peisel, creator of the online community DreamLabs.io and Laurel Lyons, spirituality coach at Origin Medicines, will guide students on a journey into deep inner realms through the experiential Lucid Dreaming Course. Astarius Miraculii, a Reiki Master with over 40 years as a facilitator, teacher, and practitioner, will lead two levels of intensive training for novices interested in learning the basic art of transmitting healing energy to the self and others. For the art and creativity sector, former Disney Animator and Master Creator Dave Zaboski will guides students through the secret practices and teachings used by Masters across time to turn thoughts into things with ease and grace. For the Embodiment Intensive, Samantha Sweetwater will empower students through movement and interpersonal communication, changing the way participants interact with their world through body language, dance and community. To learn more about the courses at Lucid University, go to http://luciduniversity.lucidityfestival.com/. Lucidity has also announced the lineup for the festival event set to run from April 8-­10th, featuring over 100 musical acts. The festival brings together an eclectic and diverse collective of conscious music creators for a weekend that blends live and electronic music and includes workshops, art and more. With a wide range of artists, music lovers can explore four different stages of music and discover up­-and-coming acts and industry veterans playing side­ by­ side. Headliner Keller Williams, ​who commands a loop pedal and a plethora of instruments, will take the audience on a journey through jazz, funk, bluegrass and genres not­ yet­ named. Some emerging artists include Haywyre​, who recently supported Zed on tour in Japan, Dirtybird Records’ J. Phlip​, whose house-­woven melodies make her a crowd favorite, and Whitebear​, flying from Australia to fill the call for Psy­Dub fans on Friday night. In line with the year’s theme of Crossroads, bridging the familiar with the new, some favorites will return to the stage, including Pumpkin​, whose set brought together the entire festival in 2015, and local jamtronica group, Tropo.​ Other artist performances will include HÄANA, Dissolv, Kaminanda, Mark Farina and Bluetech. “One of our biggest opportunities as producers,” said James Spektrum, Booking Manager of Lucidity Festival, “is having the platform to introduce new ideas.” The weekend will feature experimental opportunities for collaboration and exploration, including new live stage shows from Kalya Scintilla and Eve Olution​, as well as the Crossroads troupe, made up of performers from Cirque du Soleil, Lucent Dossier Experience and our local Santa Barbara hometown heroes. For festival information and tickets, go to http://2016.lucidityfestival.com/.